The human history of Scotland has been very turbulent and started almost 8000 years ago after the end of the last Ice Age, when early inhabitants (most likely Celtic people from the Iberian Peninsula) settled in the area now called Scotland. Around 2000 bc. 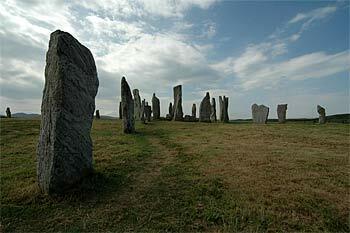 their descendants raised the standing stones which can still be found all over the country. These people also built round underground houses and numerous forts. During the Bronze and Iron Ages, tribes gathered together into small kingdoms, often based around hilltop forts. When in 82 ad the Romans marched in trying to conquer Caledonia as they called it, they had to battle with the Picts, the painted people. The Romans beat the Picts but could not conquer their land. So they raised a wall to separate England from ‘Caledonia’. That wall is known as Hadrian’s Wall, named after the Roman emperor Hadrianus and can still be visited in the north of England. Later the Romans build another wall, called the Antonine Wall, smaller and more to the north. About 400 ad the Romans had left their most northerly settlements and Scotland was divided into 4 peoples, each with its own king. The Picts were in the majority and shared the south with the Britons and Angles. The smallest group, the Scots, who originated from Ireland, occupied the south-west. Only a little isolated area was christian until the missionary St. Columba arrived from Ireland in 563 ad and founded his monastery on the Hebridean island of Iona. Under his influence christianity spread rapidly and around 800 ad almost the whole of Europe was christian. In that time period the beginning of the The Book of Kells was written on Iona and later on finished in Ireland where it now has a place at Trinity University in Dublin. A common christian belief made it easier for the peoples to unite and in 843 ad the Picts and the Scots united under Kenneth MacAlpin. The powerful culture of the Picts eventually disappeared. All that remained were the stones with the complicated patterns. Around 890 ad the Vikings started to raid Scotland resulting in the occupation of the Western Isles for 370 years and the Shetlands and Orkneys for almost 600 years. In order to form an alliance against the Vikings, the Britons joined Scotia and when in 1018 the Angles were beaten, Scotland became a united kingdom. Under the influence of Margaret, the English wife of Malcolm the 3rd of Scotland, a radical shift was started from the Gaelic culture of Scotland to the English culture of the south. Under king David the 1st this gap became even bigger. While in the south a feudal system was introduced, the north of Scotland had its own system. Here they had their own kings like the ‘lord of the isles’ and the clans with their chiefs. In 1222 ad Alexander the 2nd used the lion for the first time as heraldic animal of Scotland. When his daughter died in 1290, Edward the 1st of England installed a strawman as king and lead a devastating invasion in 1296 that gave him the stone of destiny. Scotland was totally beaten except for William Wallace. He lead an uprise that restored hope for the Scots but he was captured 6 years later and was tortured to death. 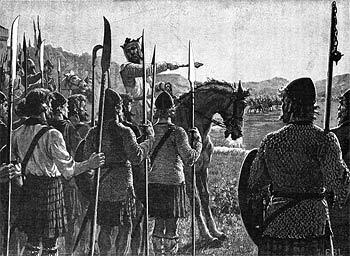 His successor was Robert the Bruce who formed an army and, against all odds, beat the English on the 23rd of june 1314 at Bannockburn, close to Stirling. Scotland regained its independency but it would last until 1329 before the sovereign state became final. The wars with England however continued. The year 1371 marked the start for the big dynasty of the house of Stuarts. James the 1st reformed the legal system and founded the first university. James the 3rd married the daughter of king Cristian from Norway and regained Shetland and the Orkneys. James the 4th was less lucky, he made a big mistake which cost the lives of 10.000 Scots during the battle at Flodden Field. The most famous of the Stuarts was Mary who inherited the throne as a baby but was not very successful as a queen. After several affairs she was deposed en put in prison. She managed to escape and flee to England but was captured there and by order of queen Elizabeth 1st killed after 18 years of imprisonment. During Mary’s reign Scotland changed from a Roman Catholic to a Protestant country. Mary’s son James the 6th reigned Scotland for 36 years when he inherited the English throne. In 1603 he moved to London and so the royal presence in Scotland ended. The parliament of Scotland still existed but the English monopoly on trade made it more and more difficult for the Scots. Influential Scots however saw a union as the only possibility for the Scots to get equal trading rights, while the English considered it a means to prevent the Stuarts from restore a catholic monarchy. James the 7th was deposed and fled to France in 1689. In 1707 the union with England became reality. In 1745 the grandson of James the 7th, prince Charles Edward Stuart, landed secretly on the northwestern shores of Scotland with 7 companions and a promise of French military support which never came. His call to put George the 2nd from the throne was only supported by some clan-chiefs (also knows as the Jacobites), but still he was quite successful. The army of rebels halted only 125 miles from London where it lost its courage en left the inhabitants in panic. At Culloden the army of George the 2nd beat the Jacobites on April the 16th 1746. Bonnie Prince Charlie became the most wanted refugee of the country, but despite the offer of a 30.000 pound reward, he has never been caught. After the Battle of Culloden things changed dramatically. It was forbidden by law to wear Tartan, play bagpipes and carry arms. The connections between the clans and clan chiefs were broken and an entire way of life ended. The clan-chiefs became feudal lords and the area where they once ruled on behalf of their people now became their property. Where ever land could be turned into money by means of sheep farming, people had to leave. These forced moves of people are also known as the ‘clearances‘ and started around 1760. Even violence was used to get them out of their living-areas, for example in Sutherland. By the time the Highlands were a popular hunting ground during the reign of Victoria, the glens were as empty as they are today. While the clearances in the Highlands continued, the south of Scotland entered a period of economic bloom. During a large part of the 18th century Scottish tobacco traders had a major position in Europe and important cotton and coal industry developed. James Watt’s improvement of the steam engine had triggered the Industrial Revolution and brought Scotland prosperity with Glasgow as its beating heart. The city would hold that reputation until the decline of the shipbuilding industry in the 20th century. 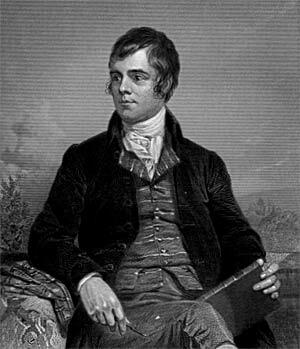 The 18th century Scotland entered a period known as the enlightenment which brought forth some famous Scots, such as the Philosopher David Hume, the Geologist James Hutton and the Poet Robert Burns. In the 19th century Scotland became famous for its architecture. A fine example is the building of the New City in Edinburgh. One of the most famous people who lived in one of these classic Georgian houses is the writer Sir Walter Scott. After the Act of Union it soon became clear that England and Scotland were never meant to be equal. Since Westminster became the new political centre, every Scottish politician had to leave Scotland. English matters were considered to be of more importance than the Scottish ones. Frustrated by that, the Scots started the Scottish National Party in 1934. They were however not always successful, partly because of their radical ideas. In 1996 the Stone of Destiny, which was taken to England by Edward the 1st in 1296, was brought back to Scotland and can today be seen in Edinburgh Castle together with the crown juwels. With the exploitation of north-sea oil the Scottish economy started to grow rapidly and more and more Scots wanted their country to be independent. In 1997 the English parliament held a referendum and as a result of that the Scottish parliament was reinstated. This was an important step and gave the Scots limited self-control and a new Parliament Building in Edinburgh in 2003.